Whereas the U.S. regime and its allies demand that Crimea be returned to being ruled by the Ukrainian Government, as it had been during 1954-2014 (but Russian at all other times), all polls, ever since at least 2013 (when the U.S. Government started polling this) have shown that approximately 90% of Crimeans want to be ruled instead by Russia's Government, and the latest of these polls was issued on March 14th. SIMFEROPOL, Th. 14 March 2019 /TASS/. Crimea remains positive about the peninsula's reunification with Russia and if the referendum was held today, 89% of Crimeans would support joining Russia, the Russian Public Opinion Research Center announced in Simferopol the results of a poll on Thursday. (1) The March 16th, 2014, referendum of the voters in Crimea, produced a 96% vote to secede. 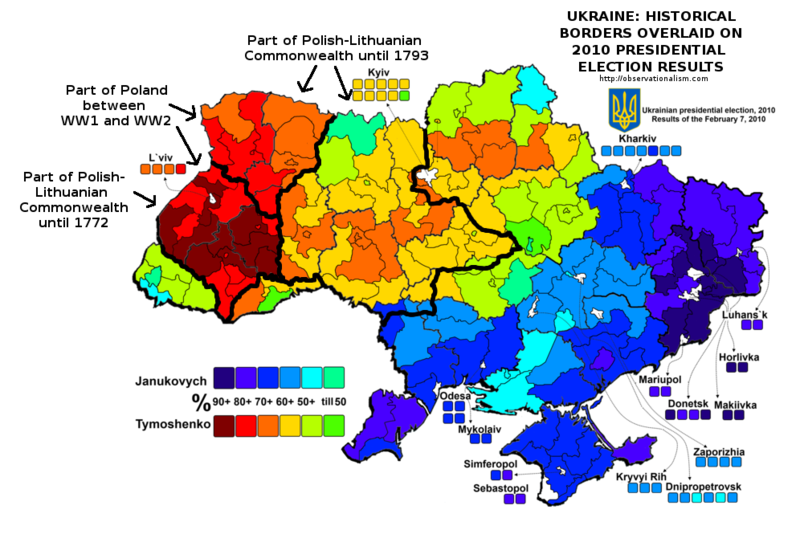 (2) Gallup polled 500 Crimeans during May 16-30 in 2013, and found that only 15% considered themselves "Ukrainian." 24% considered themselves "Crimean." But 40% considered themselves "Russian." Even before Obama's February 2014 coup which overthrew the Ukrainian President whom 80% of Crimeans had voted for, the Crimean people overwhelmingly wanted to secede from Ukraine - and, especially now they did, right after the President for whom they had overwhelmingly voted, Viktor Yanukovych, had been overthrown in this extremely bloody coup. Furthermore, in April 2014, Gallup again polled Crimea, and they found that 71.3% of Crimeans viewed as "Mostly positive" the role of Russia there, and 4.0% viewed it as "Mostly negative"; by contrast, only 2.8% viewed the role of the United States there as "Mostly positive," and a whopping 76.2% viewed it as "Mostly negative." During the intervening year, Crimeans' favorability toward America had plunged down to 2.8%, from its year-earlier 6%. Clearly, what Obama had done in Ukraine (his violent coup in Kiev) had antagonized the Crimeans. And, as if this weren't enough, the 2014 poll provided yet more evidence: "The 500 people that were sampled in Crimea were asked [and this is crucial] 'Please tell me if you agree or disagree: The results of the referendum on Crimea's status [whether to rejoin Russia] reflect the views of most people here.' 82.8% said 'Agree.' 6.7% said 'Disagree.'" In the hearts of the local residents, Crimea was still Russian territory, after an involuntary hiatus of 60 years; and so the Russian Government accepted them back again, into Russia - this was not as [NPR's] Corey Flintoff droned, "Russia's seizure of Crimea." It was Russia's protection of them from the invasion of Ukraine by the United States in a bloody coup. On this one year anniversary of the sham "referendum" in Crimea, held in clear violation of Ukrainian law and the Ukrainian constitution, the United States reiterates its condemnation of a vote that was not voluntary, transparent, or democratic. We do not, nor will we, recognize Russia's attempted annexation and call on President Putin to end his country's occupation of Crimea. The U.S and European Union may want to save Crimeans from themselves. But the Crimeans are happy right where they are. One year after the annexation of the Ukrainian peninsula in the Black Sea, poll after poll shows that the locals there - be they Ukrainians, ethnic Russians or Tatars are mostly all in agreement: life with Russia is better than life with Ukraine. Little has changed over the last 12 months. Despite huge efforts on the part of Kiev, Brussels, Washington and the Organization for Security and Cooperation in Europe, the bulk of humanity living on the Black Sea peninsula believe the referendum to secede from Ukraine was legit. At some point, the West will have to recognize Crimea's right to self rule. Here are some of the things that Crimeans were terrified of that the U.S. regime armed, backed, and patronized: this, and this. America's proxy 'freedom fighters' in Ukraine are like America's proxy 'freedom fighters' in Syria, except Christian instead of Muslim. Of course, Hitler's also were, but that regime was far more honest about its psychopathy than is the U.S. regime, which spouts about 'democracy,' 'human rights,' etc., instead of about "Lebensraum." Crimea will always be Russian. Get over it. The narrative that "Russia Invaded" still holds sway with those few who even care to extend their awareness of the world beyond the immediate borders of their little realities. I know a teacher who, before a room of children, wove the official narrative of Russian Invasion into his curriculum design while it was current news. I'm sure he is well liked with the administration and will maintain a steady career, offending nobody and achieving accolades deserving of obedient servants. He does engage in this behavior out of malevolence, out of a desire to lie to children. Oh no! He does so because he was lied to as a child and never worked that out on his way through teacher's college. Blissful ignorance perpetuating itself through the generations. George Orwell never describes the Happy Citizens in Oceania. I bet there were plenty of blissfully content citizens in Oceania. Who probably see in Black & White.